60 Greek and Latin roots, prefixes, and suffixes are broken down into six total units. 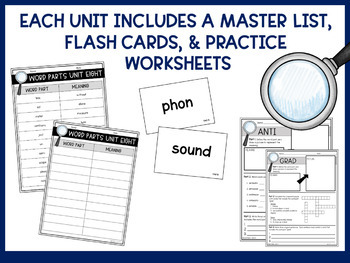 Each unit focuses on teaching students ten new word parts using a class set of flashcards, individual worksheets for each word part, and a final assessment. An end-of-the-year cumulative assessment is included to test students' knowledge of all sixty word parts. 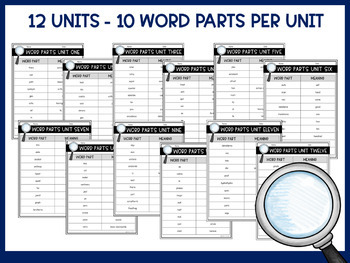 Also included with this product is a complete list of all word parts as well a blank list for students to fill in as the units progress. 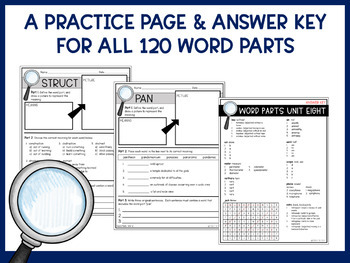 Answer keys to all word part worksheets and assessments are also included. Units 1-6 Complete List of Word Parts: A complete master list of all sixty Greek and Latin roots, prefixes, and suffixes is included for teacher use. The word parts are broken down by unit. Units 1-6 Blank Word Parts Template: A blank template is provided for students to log word parts as the units progress. Copying the blank template back-to-back on card stock is recommended. 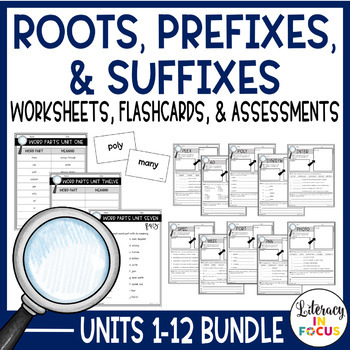 Units 1-6 Cumulative Assessment and Answer Key: A final assessment covering all six units of roots, prefixes, and suffixes is included. The cumulative assessment is fill-in-the-blank and contains an answer key. GET THE WORD PARTS COMIC BOOK PROJECT! Want a FREE resource each month? Click HERE to follow Literacy in Focus, and you will be sent the monthly freebie!